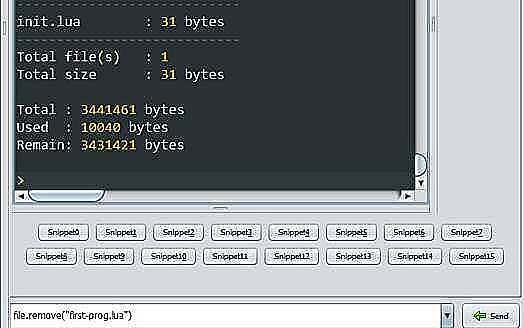 ESPlorer is a tool that uploads your LUA scripts to an ESP module that has been flashed with LUA. At the moment you can only use ESP8266 based boards but ESP32 is in progress (or use a dev build for that). You can also use it for microPython, AT commands and RN2483. TIP: You will need java installed on your PC to run this program. This page shows you how to install the program and connect it to an ESP module. It then gives you a few example scripts - including a simple web page server - to show you what you can do with lua. Note: The advantage of Lua is that it is immediately loaded - you don't compile for a minute and then wait for an upload for a minute. The disadvantage is that it is a new language to learn. However this page shows you some of its usage. There are two panels - the left one is for script editing and upload - the right one is for serial communications with the ESP module. (typically what you get when a module has been bought online). 115200 Baud for newer flash installs. You can flash new nodeMCU files here. Note: With a newer flash version of nodeMCU you can take advantage of new features such as a more Object Oriented methods e.g. timer usage. Note: Don't worry about the gibberish characters that preceed each reset - these are just status data at a different baud rate (74880 Baud). 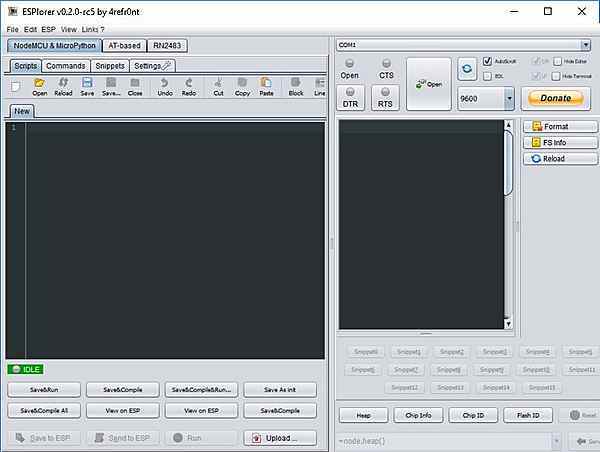 The following instructions show you how to add a file to the ESp8266 by enetering text into ESPlorer and uploading it to the file system inside the ESP8266. Enter the following text on two lines in the left panel of ESPlorer. Click the save as button (or use File > Save as) and save as "init.lua"
In the lower part of the screen click "Save to ESP". 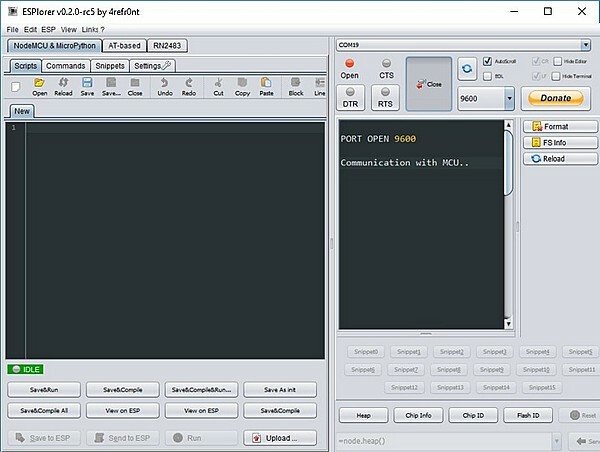 Now click Run and you should see the following in the Serial terminal window. You can also see the same output when the reset button is pressed as the file init.lua is run at start up. I found that the communication was unreliable (probably too many tabs open in the browser etc.) 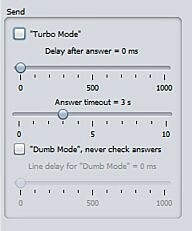 so if you find the same click the Settings tab and uncheck the following check button - so that "Dumb Mode" is unchecked as below. This slows down communication but checks the data sent so that it is reliably transmitted. In another session I did not need to do it so experiment with this. If you click the commands tab and then hit the button labelled 'List files' you'll get a list of files similar to the following. Enter the command into the bottom right box, then click 'Send'. You can either reset the nodeMCU using the board reset button or hit the RTS button in the right hand pane twice. or in the command tab click Restart ESP. I find the RTS button to be the most convenient. The RTS wire is an RS232 control (meaning Request To Send) and was originally used to signal to a device that the controller wanted to send some data. Here it is repurposed as a ESP reset signal. This also saves the file to the PC and to the ESP module and then runs it. Executes the currently opened file. Upload a bunch of files (useful for large projects). Select multiple files and they get uploaded one after another. NEXT: Now you have installed the ESPlorer software its time to make the nodeMCU do some useful stuff. On this page you will find out how to start using the Lua scripting language. It starts off with a simple LED blink and progressing to complex code e.g. how to serve a page from the ESP8266 to your local network.